So I know that we’ve discussed the crazy sources of my recipes a few times before, but we should probably discuss it again today. The idea for this recipe struck late one night. And by late, I don’t mean my usual 1-am-still-baking-cookies late. I mean almost asleep kind of late. And for those of you who know me…that’s late! So I opened up one eye, opened up the notes app on my iphone, and typed “quinoa + broccoli salad.” And it’s been in the back of my brain ever since. At first, I was going to go with a traditional broccoli salad type dressing, but with added quinoa. Then I decided to take the flavors in a different direction. I settled on an asian-inspired dressing, and I am thrilled with how it turned out. 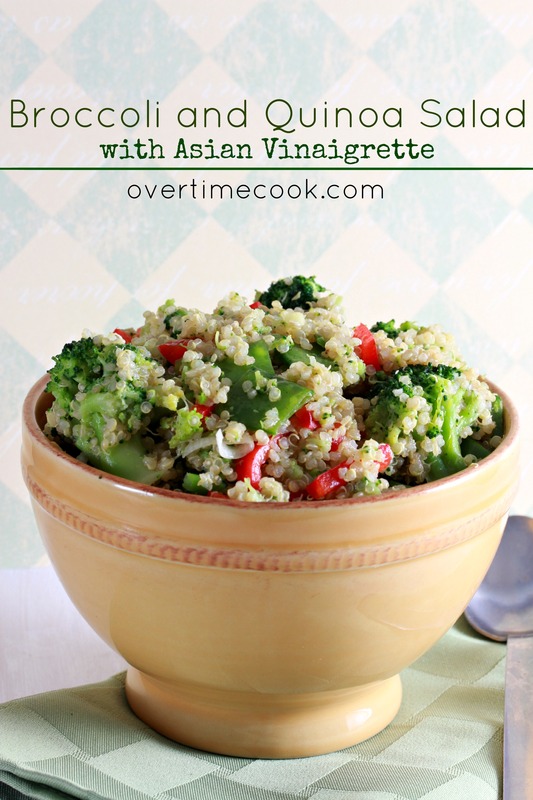 If you are a quinoa fan, or you’re considering jumping on the quinoa bandwagon, try this. Soon! It’s simple, delicious, and healthy! Boil broccoli in salted, boiling water for about 5 minutes, until slightly tender. Drain and set aside to cool. 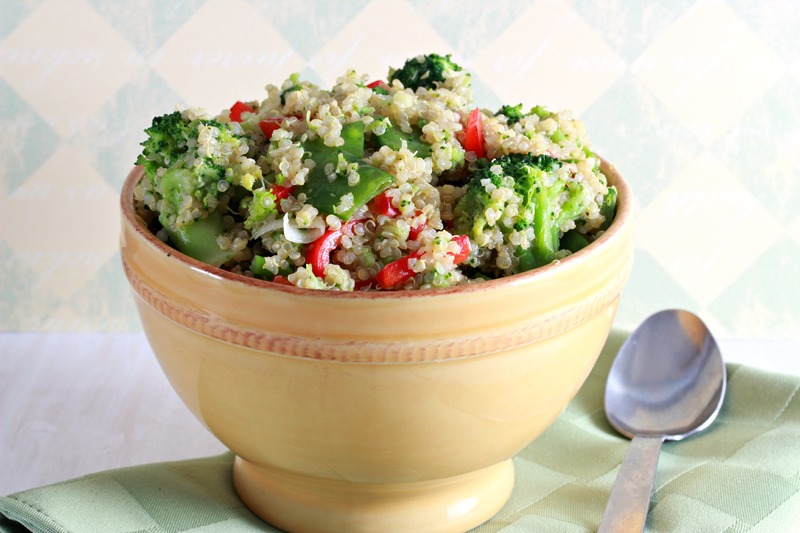 Combine the peppers, snow peas, scallions and broccoli in a large bowl. Add the cooked quinoa. Whisk together all dressing ingredients in a small bowl. Add to veggie and quinoa mixture and toss to combine and evenly distribute. The dressing really makes this dish really appealing! This sounds so delicious! I love quinoa, it’s my favourite grain. I’ll definitely give your recipe a go! we are so doing this for supper one day this week. Wow Miriam this sounds amazing!! I must try for supper tonight! Do you think I can use this dressing for a basic cabbage/ slaw? Should be good! Try it and let me know how it turns out! Looks delicious! I’ll try it for sure! Thanks for sharing with us! looks awesome! Will have to try this one. Looks amazing! Making it now. I want to serve it tomorrow for lunch, should i add the dressing today or before serving? Thanks! 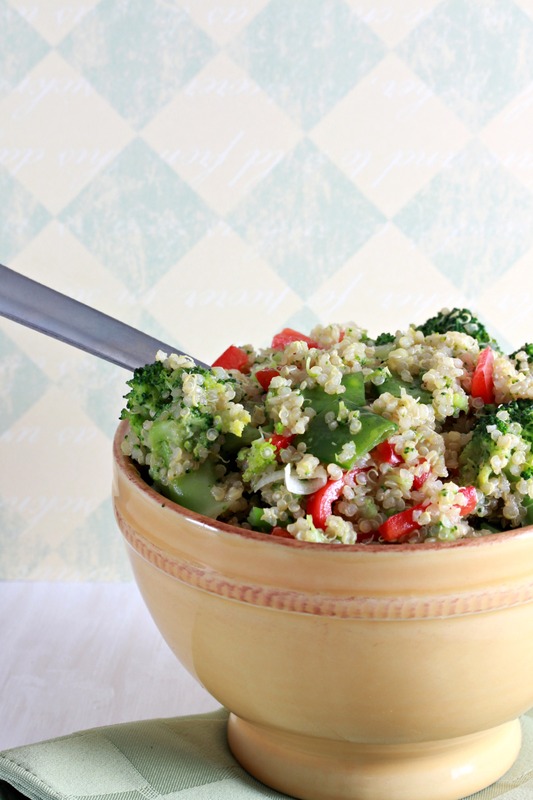 I’m always looking for new recipe’s with Quinoa, this one looks delish! Miriam this is gorgeous. What a lovely recipe. And the photos are just beautiful. Made it! Really enjoyed it! Hi, is this served hot, cold or either? Hi Miriam, can I use bodek style frozen broccoli for this recipe? And can this salad be made in advance? yes, and yes. just dress it at the last minute. I like the recipe but I was wondering why do you use salt and soy sauce? I would think the soy sauce would be enough sodium alone. But the dish looks very nice. What is the overall sodium content? Just wanted to say how much we love this salad. I made last week for Shabbos and my 7 yr old devoured it and begged me to make it every week. Just made it again and can’t wait to enjoy it. Thanks for all your amazing recipes. Can I make salad in advance and eat next day? Or better to assemble last minute? I❤ quinoa…. this is sooo my type. This is the first quinoa recipe that I enjoyed, now I’m converted!